When I was still in corporate, (naks parang ang tagal na ah!) I heard horror stories about getting the NBI clearance. That you had to go to the NBI Clearance Centers at dawn and fall in line for hours! I thought it must be an exaggeration, but when I had some friends and family go and get their clearances, they said it was true! So when time came when our whole family needed one, we had no choice. On that Monday, we woke up at 3:30am. 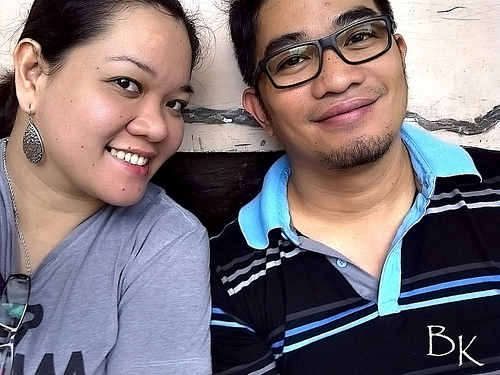 We planned on going to Robinson’s Otis in Manila. It seemed out of the way and we thought it would be less crowded there compared to the Clearance Centers in Robinson’s Metro East or Galleria. 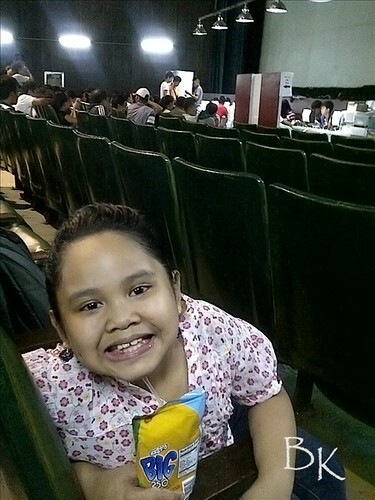 Luckily we chanced upon a blog that said that she got her NBI clearance from Ever Commonwealth Mall. That was much nearer our place, so we decided to just go there. The night before, we packed sandwiches, juices and other snacks. Berto brewed coffee for both of us and we bundled a very sleepy Bea to our van and went on our way. We arrived at the Ever Commonwealth mall at around 4:30 am. The parking lot was still closed. Good thing there was a 24-hour Mcdonald’s nearby. We parked there and Berto went ahead to check if there was a line or if they were already giving out numbers. Us, girls stayed in the van, with Bea sleeping and me reading from my kindle. According to Berto, the whole mall compound was still closed but there was already a line of more or less 20 people along the sidewalk. He has to stay there to keep his place in line since there was no numbers yet. I was able to talk to some other people in line, they shared that they’ve had to get this clearance every 6 months since they were contractuals. 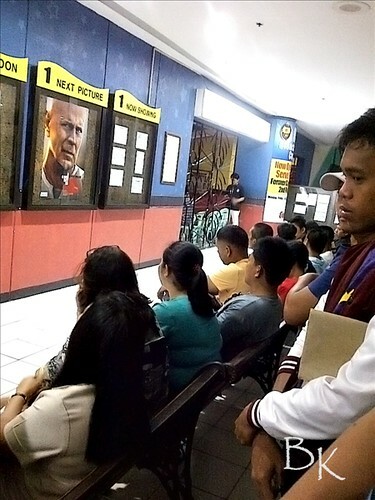 The NBI clearance system has changed. There are no more renewals. Every time you get a clearance, you have to go thru the whole process again. That must be really frustrating for them, not to mention time consuming. At around 7:00 am, the guard reminded us that we need to have photocopies of our IDs. We didn’t have any so Berto rushed to the photocopier by the parking entrance. It was a bit far but thank goodness for Berto’s long strides, he got there before most of the others arrived. After a while, the guard made his rounds again, this time reminding us of the proper attire for NBI applicants: Wearing of shorts, sandos, mini skirts, and slippers are strictly not allowed. Eeek! I was wearing my purple Havaianas flipflops because I wanted to be comfortable. Waaah! I was already starting to panic when I remembered that I had my camel slingbacks in the van. I wore it to a photo coverage a few weeks ago but on the way home I took it off because my feet hurt. I went inside the house barefoot. Good thing the shoes were still in the van! Woohoo! At around 8:00 am, they let some people in. I didn’t even realize there were other people loitering by the entrance. The ones in front of the line were outraged, saying they were there since 4:00 am then they let these people slink in?? The guards tried to appease them, apparently these people had “appointments”. I don’t know how or why. We got inside the mall through a side entrance. 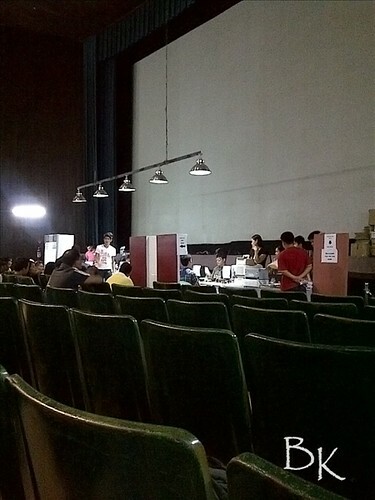 They converted Cinema 1 into the NBI Clearance Center. The guard made us fall in line again. After a few minutes they let us in the cinema. At the entrance, NBI employees gave out the application form with corresponding numbers, them they got the photocopies of our IDs. They wrote down the application form numbers on the photocopies, probably for file matching later on. We were led in the cinema and asked to sit down. It was early and everybody seemed to be in a good mood. The ushers were very pleasant and smiley. They assisted us in filling out our forms. It was a bit confusing especially for married women. Remember: Last Name (your father’s surname) Husband’s Surname for Married Woman (your husband’s surname), Given Name (your name), and Middle Name (your mother’s maiden surname). Write in BLOCK CAPITAL letters. This will help the encoders to key in your information accurately. For purpose, if it’s for employment, put Local; if it’s travel, put travel; if it’s visa application purposes, write Visa-(country you’re going to) e.g. Visa-Canada, Visa-China etc. Next we fell in line for the payment, P115 only, then we got in another line for the receipt. Next they asked us to take our seats, while keeping our line, and wait our turn for the encoding. When we were only a few seats away from the encoders, the officer in charge stopped the processing. He said that there was a system error and everybody was getting a hit! You are only supposed to get a hit if you have a name-sake with a criminal record. And if you do get a hit, you only get your clearance after they further investigate your case, after a month. So we had to wait for the IT support to fix their system before they start the processing again. This was actually a small blessing for us because it gave Berto enough time to fetch Bea from home again. He asked the NBI employees and they said we can also get a clearance for her as well. Argh! And to think we wasted time and fuel to bring her home only to fetch her again. After 30 minutes, the line started moving again. The encoders just key in whatever you wrote in the application form, then they warn you to look closely at the info they just typed in, because if you gave your OK to the data on screen then realized that there was a mistake, you have to pay the P115 again for an amended clearance. On that day they had a lot of trainees who act as encoders. They were not really that familiar with the system. I wrote Visa-Canada as purpose in my application form, but the encoder chose Travel-Canada from the drop down menu. When I asked the supervisor, he said it there was a Visa-Canada option down in the menu and he reprimanded my encoder. 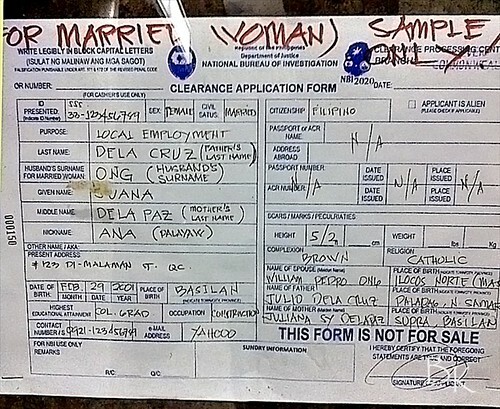 NBI clearance is an important document. It is needed for work here and abroad, travel, even migration. I mean people’s futures are on the line here and maybe they shouldn’t trust the trainees with such a critical job as encoding. Not everybody is as meticulous as me. This will set them back a month if the information on the clearance is not accurate! After encoding, biometrics was next. They take a really dark picture of you thru a web cam. I asked if I could smile, the NBI guy said go ahead. I initially felt bad that I didn’t retouch my make-up but when I saw how bad the picture was, I realized it wouldn’t have made any difference. Fingerprinting came next. The biometrics process took less than a minute, then my receipt was handed back to me with a date stamped on the back, one month after. I was a hit? I looked at hubby and he was a hit too, so was our Bea. I thought it was another system error but when we approached the officer-in-charge to clarify the matter, he said that this was the SOP for applications for Visa purposes, auto-hit. Then he said that if we were in a hurry, we can request it to be rushed and we get the clearances within 30 minutes instead a month, for a small of P500 each. We had no choice. P1,500 went out our pocket and went into his. 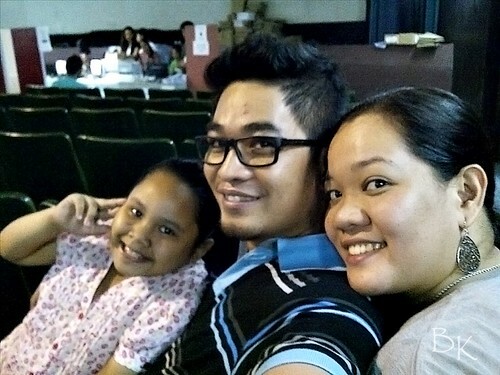 Here we are with happy smiles while waiting for our NBI Clearances being “rushed”. We were done at around 10:00 am, just in time for the mall opening. I must say, that was quite an experience, but I wouldn’t want to do that again. 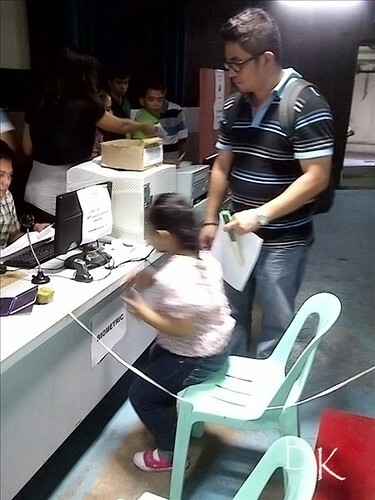 The problem is the long line since they only accommodate 500 applicants a day, but once inside the process is a breeze. Wearing of shorts, sandos, mini skirts, and slippers are strictly NOT ALLOWED. Take care when filling out the application form, especially for married women. Remember: Last Name (your father’s surname) Husband’s Surname for Married Woman (your husband’s surname), Given Name (your name), and Middle Name (your mother’s maiden surname). For further concerns, click the link to the NBI frequently asked questions. UPDATE: FYI, a reader informed me that when he/she went to Ever Gotesco Commonwealth last September 9, 2013 and sadly, the NBI Clearance Center there is no longer open. You should probably just drop by the NBI website to check out the updated list of Clearance Centers before heading to one. Thanks! Went there earlier before I saw your blog, should have read it first. At least there's someone who writes about these updated processes and stuff online. The Special Appointment is for those who got cut off yesterdays' processing. I was one of them. I visited the NBI site at EVER Commonwealth the day before and I was asked to log in the lady guards' record book and was given a piece of paper to have it signed by the manager inside the premises and was asked to come back at 7-8 am in the morning. Before I left, i read the guidelines posted on the boards to ensure I have all the things I need once I come back. Unfortunately for me, no one mentioned anything about photo copying my IDs. It was never posted outside the NBI place. They will only announce it when you're there, and a signage before you come in the side entrance that it's a "new requirement." By that I was late with my so called "Special Appointment" because I had to rush to the copier (did I mention they were the only one open at 6 am in the morning) and line-up again. This shouldn't have happened if in the first place they posted a notice on the bulletin boards outside the cinema entrance or at the lobby entrance of the mall. I could have photocopied my IDs the day before. Not all people can go online and check out their website. Most of the time they go by asking around and reading the bulletin boards. Two Words: nightmare and monopoly. Regarding the photocopy machine, that happened to a person in our line too. We were already asked to go inside but she still wasn't back from the copiers, probably because of the number of people getting their IDs photocopied. Tsk tsk. such a hassle. I wonder how long it took for you guys to finish the whole ordeal? Actually, it was really the waiting in line that took so long. Once inside the theater, it took us less than 2 hours, including the wait due to technical problems and "rush" verification and printing. The whole ordeal lasted more than 5 hours, from falling in line up to being handed the final printed clearance. Hi! It was nice to read your experience, was able to arm myself with info. Unfortunately, according to the security guard of the mall, the satellite office in Ever Commonwealth has closed (I went there last September 9, 2013). It would be helpful to your future readers if you could put an update on top of this post. Just a suggestion, though. :) Hassle lang talaga kumuha ng NBI Clearance, isa pa naman sa laging hinihingi to lalo na sa mga nag-a-apply. Kawawa yung mga contractuals. Hi! Thanks for the heads up. Already updated my post. Thanks again! I'm getting ready to process my NBI Clearance today. Let me give you updates for anything I would notice new or different with regard to the overall process. Thank you for sharing guys! And neat work on your blog. If you took the time to read the comments and the update on the lower part of my post, you'd know that I did mention that it is closed. Does that make my whole blog useless?? Basa-basa din pag may time.